Description: Shows how 3 mirror retroreflectors work. Put the black paper on the bottom mirror of the corner cube and Alexander's bear on top of the paper. Ask how many images are present. Ask how many images will be visible when the paper is removed. Put the C clamps at one edge of the table to act as a rim holding the front edge of the corner cube in place. Raise the rear of the corner cube about 40 degrees with the jack. 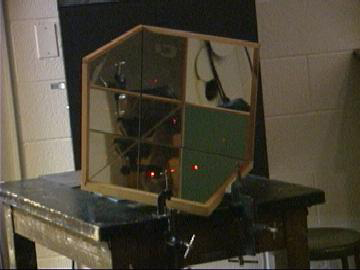 Stand at the opposite side of the room with a laser pointer and aim for the center of the cube. Ask a volunteer from the audience to clap chalky erasers so that the laser beams are visible. Note that the incoming and outgoing beams are always parallel, regardless of incident angle.